Maybe you’re wondering what is a natural pregnancy. Maybe you’ve had five natural, homebirths. The majority of us were born into the modern medical care system where pregnancy is treated as an illness and a number of treatments, tests, and drugs are necessary. Those who chose to look into a more natural pregnancy find that somehow, women have birthed naturally for eons and our bodies were designed to hold and deliver a baby. 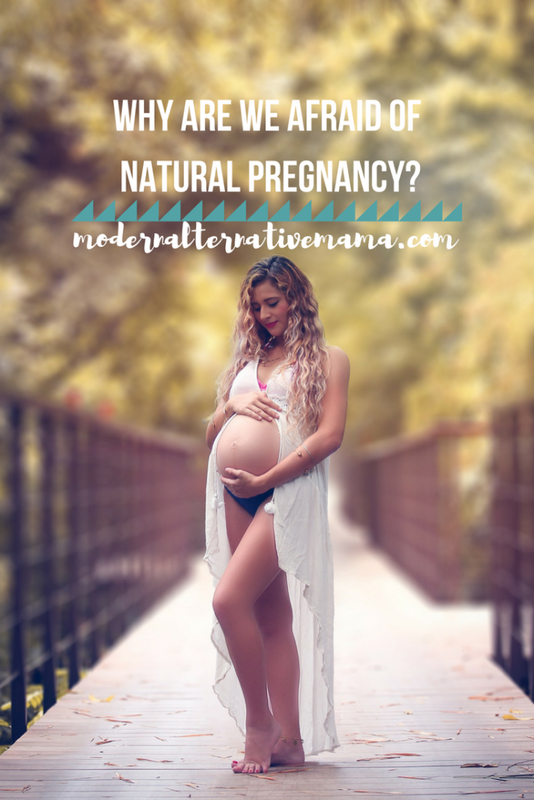 So, Why Are We So Afraid of Natural Pregnancy? One thing I have seen in my life and in most women around me is that with each subsequent pregnancy, a mother plans to have her pregnancy and delivery more and more natural. It’s clear that we long for what should be, even when finding what that is is hard. What keeps us away from experiencing a natural pregnancy? I would start with the issues below. Let’s face it. Pregnancy and delivery aren’t something we go through everyday, and that can be scary. We think that it should only be handled by the “experts,” physicians who have been trained in surgery (cesarean) and may have not seen a natural birth. To pacify their insurance, obstetricians want to monitor every moment of pregnancy, although studies show that has no positive outcome. Why? They’re afraid. Afraid they may miss something or do something wrong, and then try to control it. Pregnancy, like life, cannot be controlled. Midwives, CNMs or CPMs, have experience treating a pregnancy holistically, and are instructed in what a natural pregnancy looks like. I’ve seen a midwife help a hospital nurse during birth. It showed me just how lacking some (I am not saying all) hospitals, physicians, and nurses are in birth knowledge. You can ditch the fear and learn to trust your body, trust your baby, and focus on creating a positive pregnancy rather than a worried, controlled one. Many of us don’t have a natural pregnancy because we simply don’t know it’s an option. Our doctors scare us that anything that is natural is dangerous, and of course, we want to keep our baby safe. So, we stop looking. We stop researching. We stop questioning. There is so much evidence that choosing a natural pregnancy and delivery is not only healthier for mom and baby, but that it also brings better health outcomes – lower maternity and fetal deaths, lower cesareans, lower rates of epidural and pitocin, and quicker recoveries. Having a smooth, natural pregnancy isn’t as easy as sitting back, eating a bunch of Oreos (totally guilty with my first), and hoping everything goes well. It takes work to ensure we are in good shape, getting enough sleep, keeping our stress low, and eating a high protein and fat, whole foods diet. We have to dig into research to learn our options, how to object to what we do not want, and build a positive outlook on pregnancy. As soon as you go natural, there will be that cousin, friend and mother-in-law that doesn’t agree. They’ll hand you pharma-funded studies that show how dangerous natural pregnancy is. You will find your pregnancy support groups limited, and only a few, crunchy friends who really understand your decisions and support you. It doesn’t feel good to be the odd man out, but if that odd man has a healthy pregnancy and baby, it’s worth it. Expect this, and be ready to combat their arguments with confidence. Though women have been giving birth forever, we are told our bodies are dysfunctional, and they need help to carry and delivery a baby. The truth is our bodies can still produce a baby (alone, with little help, and well!) without loads of medical interventions. If you are struggling with trusting your body, do a series of positive affirmations during pregnancy and feed into your pregnancy good food and good vibes. We are taught in most developed countries, and certainly in the United States, that doctors of all kinds wear the white coat and the pants. Asking for a second opinion or questioning their treatment or diagnosis is on par with heresy, and if you think you’re going to have a healthy pregnancy without 4 ultrasounds (which are harmful and inaccurate) and a flu shot (never tested for safety during pregnancy, and it says so on its box), you’re crazy. Reality is that all doctors perform a service, and just like getting your nails done, you have the right to direct them, reject their suggestions, and not pay if they do not do what you want. If you want to have a healthy pregnancy, before you see a physician, throw away all your preconceived notions about birth, and research for yourself. There is nothing to be afraid of planning a natural pregnancy. Read books by educated midwives, such as Ina May Gaskin, watch documentaries such as Business of Being Born, and contact midwives and doulas in your area to learn more about the natural pregnancy alternatives in your area, state laws and hospital policies, and more ways to find support with your natural pregnancy. 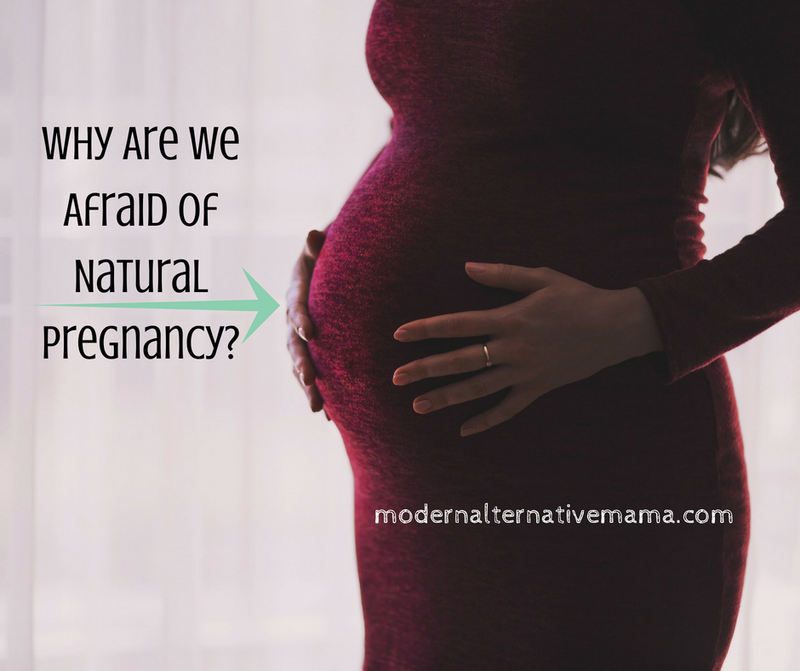 Were you afraid of natural pregnancy? What helped you overcome that fear? I had my first baby at a hospital but wasn’t pleased with the process, so with our next ones we have done amazing home births! Absolutely. There are emergencies and there are special situations where we need medical care. But, these are emergencies, not the norm. Every woman is built to have children, it is just in our culture today, there are many factors which may cause that not to happen as well as nature intended. Fear of childbirth make sense though. There are risks involved no matter what “kind” of birth you have. And honestly childbirth hurts for most people. Fear of pain is normal as well. No amount of trust is going to make one’s body behave although “trusting” your body may decrease anxiety. Fear of childbirth allows us to make decisions. We fear post partum hemorrhage. So we implement measures to monitor and manage it. Obviously we shouldn’t use fear to completely take away options from women. I had a “natural childbirth” but honestly I will usually go with doctor recommendations. I am involved in my care and I may questions things here and there, as you get the occasional provider not always making the best decisions, but I trust their education. Our bodies are not perfect, they are not designed (that is what I believe anyways), so therefore things do go wrong. Not every woman’s body is dysfunctional but many bodies no not function optimally. I care more about choice for women and less about getting back to natural birth and why we are so afraid of it. Please, if you are reading this article and considering having a completely medical-free birth, please look at infant mortality rates and how they have fallen dramatically with improved medical care. Hear the stories of mothers who have had incredibly normal, healthy pregnancies until labor, and who would have died or lost their child if they were not in a hospital. Doctors, nurses and medical professionals are there to help, and to save as many lives as possible. If you aren’t happy, ask them questions, and they should hear your concerns and respond to them. But let them look after you. I feel that many readers of this article are missing the point of alternative unassisted pregnancy. The medical community is absolutely important, but in it’s place. Unassisted pregnancy is simply bestowing choice and options back into the hands of the mother under circumstances in which it is safe to do so. If you feel safer with medically guided pregnancies, that’s great. If your pregnancy is healthy and safely managed at home, that’s great as well. Eiether way, these should be well deliberated and informed decisions. I myself have had no problems conceiving, carrying, or delivering- thus I feel pretty confident in guiding my own care unless (obviously as with any other situation in life) something goes wrong, in which I would seek care from the medical community. But let’s be honest, things go wrong, even at the hospital- risks are never eliminated. So do what’s best for you and your family.